Our Big Bird is manufactured from imported Fluorocarbon Polyester Coating Aluminum Alloy and is super light. 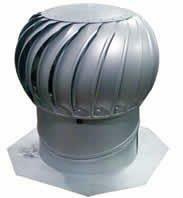 The lightweight construction allows for unhindered spinning for effective and efficient ventilation. Our turbine ventilators use 3005# aluminium alloy as a base material, with its surface being treated with anti-oxygenized film, on which sprays 20µm fluorine carbon polyester coating. Be it rain or shine, BigBird aluminium construction will remain rust-free and it requires no maintenance. Silent Operation Using free wind energy, BigBird operates quietly, making you unaware of its presence. Designed in Australia for Australian conditions making it ideal for South African homes. Healthy Living * BigBird ventilator is a free spinning roof ventilator that provides fresh air in your roof space and living area all year round 24 hours a day free of charge. 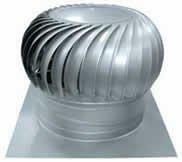 A turbine ventilator provides a form of natural ventilation, moving air continually and causing trapped, stale air to be replaced with cleaner, cool air from outside. The turbine is a free-spinning roof ventilator, which uses a combination of wind energy and convection to facilitate air changes.